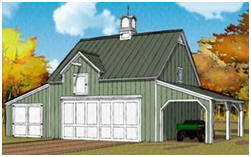 The Elm Pole-Frame Garage Plan Set has a 24'x24', two-car main garage with stairs up to a full loft. The loft has two big windows and a convenient exterior hatch door with a lift post. 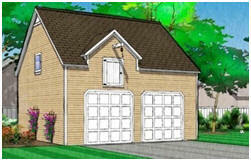 Optional lean-to plans that are included with the drawings allow you to expand your garage on either side or across the back. You can add parking spaces, carports workshop areas, enclosed storage sheds or open shelters. And, you can expand your garage at the time you build it, or at any time in the future. The plan set that you can order shows seven sample layouts. But, you can actually pick and choose the lean-to additions that you want and build them on either or both sides of the main garage or across the back. 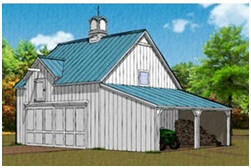 You choose almost any exterior materials and either conventional overhead garage doors or barn-style sliders. 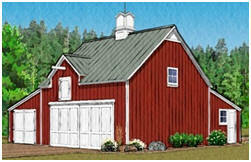 Create the perfect two or three car garage, four-car carriage house, workshop or all-purpose backyard barn with the help of the Elm Pole-Frame Garage Plans. Plans are $59.00 plus $5.00 for shipping, for three complete sets of drawings. The plans come with a complete money-back guarantee and include optional lean-to sheds, shops, garages and carports that help you build dozens of different layouts, including the ones shown above. You can build any one of them, or you can use the main building plans and any of the lean-tos to create your own custom design. Why three sets of the same plans? You may need to supply drawings to your building department, zoning board, community review board and building supply center. Extra sets of plans also come in handy when you want to get competitive bids from contractors and subcontractors. Our quick, secure checkout accepts PayPal and all major credit cards. Your plans come with a complete money-back guarantee. Order them and review them for as long as you want. If they don't meet your needs, for any reason, just return them for a prompt, complete refund. We are proud of our plans, of our guarantee and that we've been a PayPal Security Verified Merchant, continuously, since June, 2000.